Influencer marketing is the new endorsement model that enables brands to connect with consumers and establish trust. Influencer marketing is becoming a bigger part of marketing budgets, and with good reason. 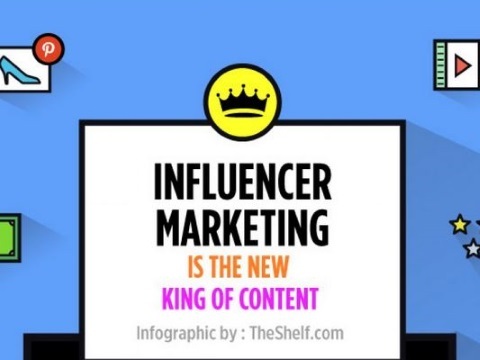 An infographic from The Shelf, a marketplace that connects influencers and marketers, demonstrates why influencer marketing is the new king. Bloggers can be highly influential and are the third-most-consulted consumer decision tool for shoppers. According to the infographic, blogs trail only retail and brand sites, while ranking higher than Facebook, YouTube, Pinterest, Google+, Twitter and Instagram. However, consumers are more likely to trust influencers than brand content. 92 percent of consumers trust recommendations from others, even people they don’t know, over branded content. 70 percent say that online reviews are their second-most-trusted source, and 47 percent of U.S. readers consult blogs to keep tabs on trends and ideas. There is already a lot of money in the influencer marketing space. 65 percent of brands participate in the market, 52 percent of companies have stand-alone budgets for sponsored social content and 25 percent have budgets in excess of $500,000. Influencers can work to solve many shortcomings your company may have. Influencers can teach consumers about your products, lend search-engine-optimization authority, counteract negative feedback with positive feedback, increase sales and help with user-generated content. To see how influencers can create a marketing ripple effect, or to see which product verticals have the highest amount of influencers, view the infographic below.